The SS Florizel was a passenger ship built to brave the icy waters around Newfoundland, and used in sealing expeditions in the spring. 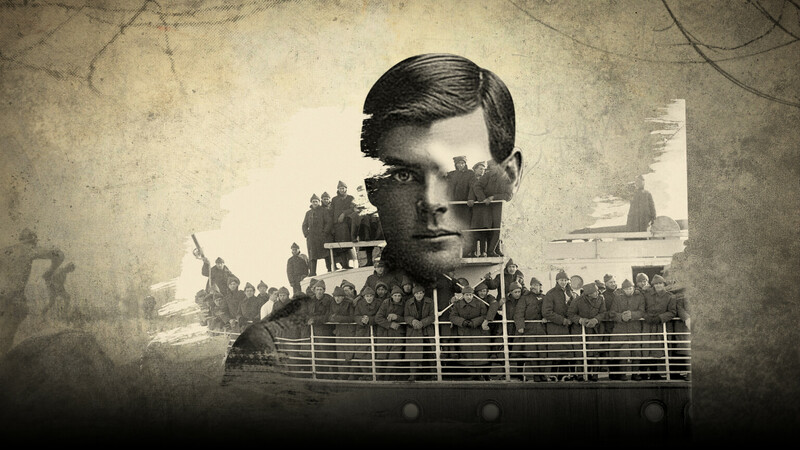 In October of 1914, The First 500 sailed over on the Florizel, joining 32 Canadian boats, escorted by seven warships. Altogether this convoy carried 537 Newfoundland troops, 32,318 Canadian troops and 6,816 horses. The fleet took 10 days to arrive in Plymouth on the shores of Great Britain. The First 500 are nicknamed the Blue Puttees upon their arrival in Great Britain, because their puttees are blue instead of the usual khaki. Once overseas, the traditional khaki puttees quickly replace the homemade ones. In 1914, Newfoundland is not yet part of Canada. It is still a self-governing British colony with a population of only 240,000, compared to the 8 million Canadians living next door. In February 1915, four months after arriving in England, the Newfoundlanders are assigned to guard duty at Edinburgh castle. They are the only non-Scottish regiment to receive such an honour. As more Newfoundland recruits arrive in Britain, they join them until the regiment is 1,500 men strong, enough to form a full battalion. Training is still intense but more and more boring. Soldiers look for distractions. Some fall in love with Scottish women and get married before going to the front.